Do you love strawberries? Do you also love taffy? Then you have met your match! 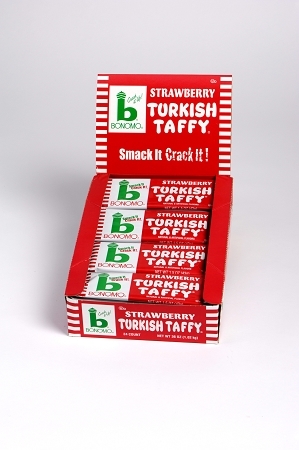 Bonomo Turkish Taffy comes in strawberry bars that will tickle your fancy and have your mouth watering for more! This twenty-four (24) count box of strawberry Turkish taffy is the perfect fit. Get your box today! If you can’t choose just one flavor, check out the other product pages. Bonomo Turkish Taffy comes in a variety of flavors and sizes so you’ll be sure to find exactly what you are looking for! Strawberry Turkish Taffy is one of the greatest candies ever!!!!!!!!!! I am so glad they brought it back a few years ago. Now if they would bring back Snirkles and Power House candy bars, all of my favorite candy bars will be back. 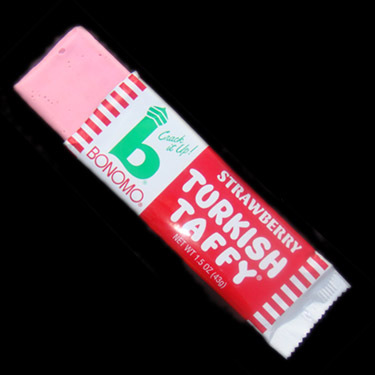 as a young kid i loved the strawberry bonomo taffy, but lost track of the brand and spent the next 50 years looking for it again. i walked into a large candy store at farmers market in los angeles and i thought i was seeing things. just as good as i remembered and worth the years i spent finding this treasurer again. First of all I have to say this was a great tasting product and the service provided by Bonomo Turkish Taffy was excellent.